Last post I promised sunny. The weather has been anything but, so I’ve had to make some sun instead. This is such a straightforward pattern, but the result is very pleasing. The pattern suggests making it 15 inches in width, but I only made it 8.25 inches. I never wanted to make it 15 inches wide as it would just be too bulky for me, but as luck would have it, I ran out of yarn just after half way. As it is, I’m really happy with the width. For a long time I was anti-cowl, but this pattern has made my steely resolve waver somewhat. I’m still not a huge fan of the smaller cowls, but there are a few longer cowls that I might consider making in the future. The yarn started life as a diagonal lace scarf. However, it curled badly so I ended up with a kind of draught stopper/rope thing. It seems much happier to be a big seed stitch cowl. It’s possibly a little rough for use around my neck, but I got used to it pretty quickly. I’m starting to feel like the kiss of death for certain Bendigo Woollen Mills colourways. Sunflower and the light grey I used in my Golden Hands striped vest, were discontinued a few years ago. This run continued last week when this year’s shade card arrived — two lovely rusty red colours, Rust in Rustic and Tuscan in Classic, have also been discontinued. So, if there are any Bendigo Woollen Mills colourways that you’re not a fan of, let me know and I’ll start liking them. It’s a surefire way to get them discontinued. As a postscript to my last post, I’ve decided to frog Pickadilly. The more I think about it, the more I’m convinced that they problem lies at the yoke. I’m determined to make it work, but it does mean reworking the pattern (again) to make it fit well. As DrK mentioned, top down raglans aren’t as easy as they appear on the surface, even though they’re often put forward as the ‘easy’ jumper pattern. While seeing a jumper or cardigan (slowly) appear before your eyes is very alluring, it doesn’t make it immune from fit issues. This pattern is a perfect example of that for me. Thank you everyone for you input, you all helped me take the in out of indecision. Nice and bright, the perfect antidote to a grey Melbourne Winter! Sunny indeed, a lovely burst of colour against this grey day! I agree about cowls – I have long been anti but am beginning to think the longer ones (that can also be used as a hood) are not such a bad idea. 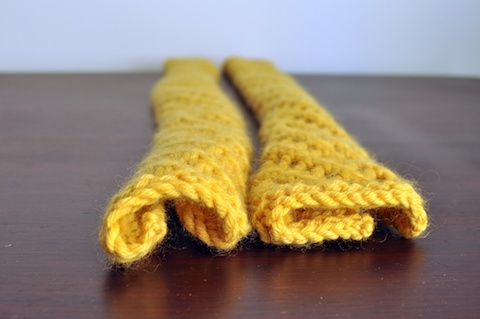 They are sometimes called “wimples” on Ravelry if you’re looking for more patterns. Wow – your cowl looks amazing. I love the bright colours. I am knitting a gap-tastic in cherry red alpaca, and think that it will get a lot of wear. oh what a gorgeous yellow! enough to cheer anyone up. im not a fan of the small cowl either, i think i worry about feeling suffocated, but this is a lovely design. as for BWM and their stupid colour choices. pffft. 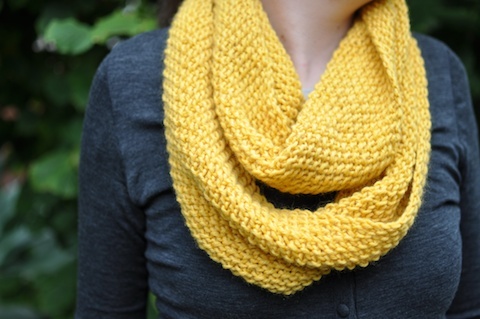 cowl is an excellent use of re-purposed yarn – beautiful! love this cowl so much! I’m not a yellow person but it looks gorgeous! well done. I’m a huge bendigo fan so I love seeing it all made up!